Nothing is certain and no one is safe in the second book in the highly praised Dust Lands trilogy. It seemed so simple. Defeat the Tonton, rescue her kidnapped brother, Lugh, and then order would be restored to Saba’s world. Simplicity, however, has proved to be elusive. Now, Saba and her family travel west, headed for a better life and a longed-for reunion with Jack. But the fight for Lugh’s freedom has unleashed a new power in the dust lands, and a formidable new enemy is on the rise. What is the truth about Jack? And how far will Saba go to get what she wants? In this much anticipated follow up to the riveting Blood Red Road, a fierce heroine finds herself at the crossroads of danger and destiny, betrayal and passion. As the second story in the Dustlands trilogy continues, we find Jack is now on his way to find Molly, to share the tragic news of Ike's death. Molly and Jack share a history, and he knows that this is one message he needs to deliver personally, no matter how far the news takes him away from Saba. He has agreed to meet Saba, who is making her way to the Big Water, along with Lugh, Emmi and Tommo. As trouble erupts at the inn with the Tonton, Jack's story comes to an abrupt halt, and the book continues from Saba's point of view. Since Lugh's rescue, he has never been the same. He won't speak of what happened upon his capture, he isn't grateful, he isn't thankful and is consumed by a quiet rage. Saba can hear the dead, those that have died as a direct or indirect result of her decisions. The voices call to her in the wind, Saba... Saba... She needs help and quickly, before her mind deteriorates. Luckily they are driven towards a spirit healer, who knows how to read the stars. Al Saba knows is that she needs to reach Jack, he should be waiting for her by now. When Maev brings word of a Tonton attack on the Hawk's base... And Jack working with the Tonton. In an instant, Saba finds herself without an ally, Jack is branded guilty, but no one knows him quite like Saba and she needs to find him. With the heartstone that Jack returned, now in her possession to guide her to her heart's desire... Then why is it suddenly hot against her skin when she stumbles along DeMalo. I think of what we might say. Him to me. Me to him. I ain’t no soft girl. I don’t know no soft words. Be with me, Jack. That’s what I’ll say. Burn with me. Shine with me. DeMalo is now leading a resurrection, the Tonton weeding out and killing the sick, injured, old and weak. Branding those remaining as breeders, farmers and those that can nurture the world back to a time before the 'Wreckers'. But there is sanctions brewing, a revolution is forming... And this time Saba needs to decide where her alliance lays. 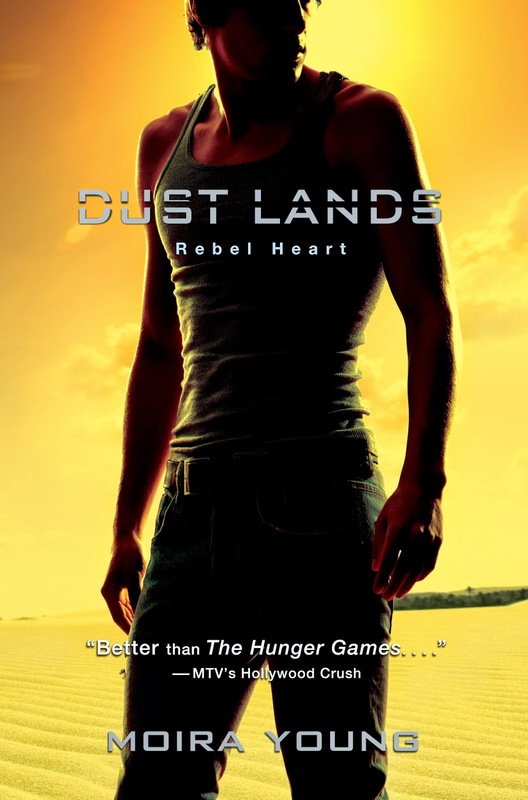 I love the Dustlands trilogy. If you can look past the broken English and use of slang, it's one of the most well written and unique post apocalyptic young adults novels to date. It's set in a dystopian future, where today's generation have long since killed the planet. The land is barren, clean water is scarce and it is a sad lonely society. Saba is an awesome female heroine, she is tough, fearless and will move heaven and earth to protect what's hers. In Rebel heart, we see a softer side of Saba. She's vulnerable and self conscious and indecisive. She struggles between the love for her twin brother Lugh, who is emotionally volatile, Jack, and the intense DeMalo. The revelations towards the end, leave more questions than answers, and no doubt setting the scene for an epic finale to the series.